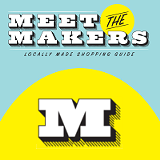 Shop Local with the Meet the Makers Artisan Guide! The Meet the Makers Artisan Guide is the perfect place for the socially-active and environmentally-conscious shopper to find gifts all year-round! It features independent, California-based artists and craftspeople who sell locally-made/sustainable products. This special catalog was featured in the East Bay Express’ 2017 Holiday Guide on November 22. All of the makers are also available for browsing on the Meet the Makers website!